Max Mutchnick donated the Marlo Bundo book to 1,121 school libraries in Indiana. The John Oliver-promoted children’s book in which Vice President Mike Pence’s pet bunny, Marlon Bundo, falls in love with another boy rabbit, is not only a best seller but will now be available in every elementary school in the homophobic Pence's home state of Indiana. 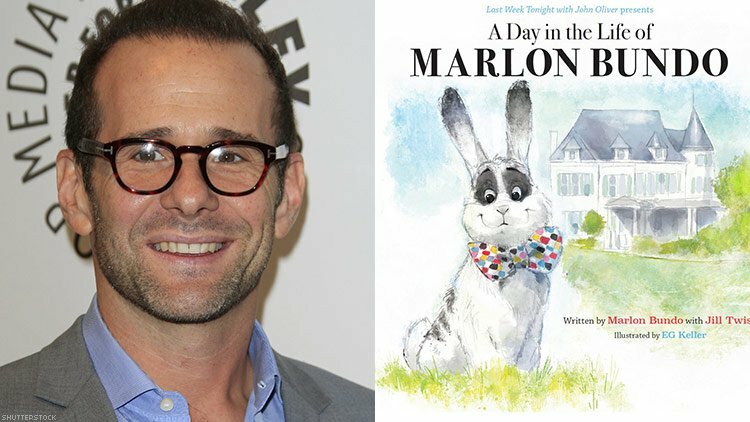 One of Will & Grace’s creators, Max Mutchnick has donated a copy of A Day in the Life of Marlon Bundo to each of the Indiana schools, according to The Hollywood Reporter. "I would like to donate this copy of A Day in the Life of Marlon Bundo to your library. After hearing about the book, I brought it home and read it to my twin daughters. It's a poignant story about how love and community can rise above intolerance," Mutchnick wrote in a letter to the librarians of Indiana’s elementary schools. In 1998 Mutchnick and David Kohan created the landmark hit Will & Grace, which became the first TV series to feature gay men in leading roles. The has series proved its lasting impact, with the revival of the show making a big splash last fall — 12 years after its original run ended. I was blown away by the new John Oliver children’s book, “A Day in the Life of Marlon Bundo.” With Easter upon us, I wanted to not only support the brilliance of John Oliver, but also celebrate the Gayest Bunny of Them All: The Easter Bunny. So I decided to buy a copy of Oliver’s “Bundo” (written by Jill Twiss) for every public grammar school in Indiana. All 1,121 of them. Here’s why: Mike Pence has had an enormous platform in Indiana, and as it relates to gay people, he’s used it to spread a message of intolerance. By donating these books, I hope to counter those efforts and provide positive role models and a story of inclusion for children in Pence’s home state. If this book can help one boy or girl in Indiana love and accept who they are, I know both Marlon Bundos would be proud—even though one of them is on the downlow.